Oh what are you complaining about now? Resisting cynicism is a difficult, if not impossible task. In news commentary, as in life, you try to tell yourself that human beings have a basic, elemental goodness to them that if nurtured properly, can outgrow urges to evil, pettiness, hatred; but then Donald Rumsfeld releases a solitaire app. Donald Rumsfeld, a man directly involved in two of the world’s most destructive conflicts in recent times, a man behind the Abu-Gharaib prison complex and its advanced interrogation techniques, that man, that guy, you know, the one who said the thing about known unknowns – he has released a solitaire app. Now what’s there to be cynical about, exactly? Does the idea of Donald Rumsfeld playing solitaire, help designing an app and publishing it to market rank alongside Tony Blair’s Middle East Peace Envoy appointment? Not exactly. In fact, the idea of an alleged war criminal making an app based on a game where the user plays alone is pretty fitting – Donald Rumsfeld, like his brand of American Neo-Conservatism, alone, playing a game in a dark room, while the rest of the world has a kickabout. Does such a thing really seem so strange? No – the cynical urge comes in, the guffaw, the sigh, the tendency to go, ‘oh sure – of course he did!’ after the point. It goes beyond the idea that Donald Rumsfeld prospers while at least two countries languish as a direct result of his actions as Secretary of Defence – the cynical urge comes in at the intersection of American military brutality, the unofficial ‘pardon’ a man like Donald Rumsfeld is given, and the banal, laughable consumerism that he’s now involved in. From Halliburton to Solitaire – that feeling – the idea that a man like Donald Rumsfeld is given a second chance, when so many others aren’t. Oh sure – yeah – of course he did that! But there’s an alternate trajectory here too: A feeling of lost hope. Maybe, in another world, given a different kind of ambition, Donald Rumsfeld could have been a name familiar to tech-junkies only; He could have been an early-tech pioneer: an inoffensive advocate for the pleasant delights of private games played on machines. It’s not a Hitler-as-artist melancholy you’re feeling, but there is something there. Another feeling of cynicism: What do we actually want? 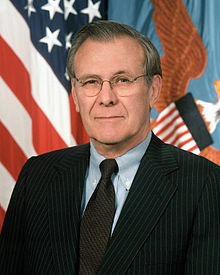 Do we want Donald Rumsfeld to suffer? No. I would like him to be put on trial, a fair trial – something his policies denied so many. But it probably won’t happen. Will he benefit as a result of his app? Probably not hugely – but there will be a certain kind of appeal for a certain set of consumers. What we can do is try to not be cynical, try to join in when the world offers us a kickabout in the park, and not sit in dark rooms, alone, thinking we know all the answers. Welcome to 2016! Year of instant turmoil!